Miller Monroe & Plyler PLLC is pleased to announce that partners Jason A. Miller and Jeffrey R. Monroe were selected to the 2018 Legal Elite list by Business North Carolina magazine. This marks the sixth consecutive year that Mr. Miller and the third consecutive year that Mr. Monroe have been honored by Business North Carolina magazine. Business North Carolina magazine honors Tar Heel lawyers by publishing Business North Carolina’s Legal Elite, a listing of the State’s top lawyers in business-related categories. Winners are chosen not by the magazine’s editors, but by the state’s lawyers. In developing the list, Business North Carolina made ballots available to more than 20,000 Tar Heel Lawyers and only 3% were selected for Legal Elite. 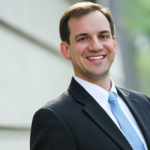 Jason A. Miller has litigation experience in state and federal courts throughout North Carolina and beyond. He has represented Fortune 500 companies in complex business litigation matters, builders and developers in real property disputes, information technology companies in trade secrets disputes, partners in closely-held company disputes, investors in business deals gone awry, and dozens of cases in between. Mr. Miller has litigated matters in more than a dozen counties in North Carolina and is licensed to practice in every state and federal court in North Carolina. Mr. Miller is also licensed to practice law in the state of New York. Jeffrey R. Monroe has a broad litigation practice with a focus on fiduciary disputes and personal injury claims. He often represents individuals in will caveat actions, estate disputes, and cases involving mismanagement of funds entrusted to a guardian, trustee, administrator, or other fiduciary. Mr. Monroe also has extensive experience litigating business disputes, construction disputes, and a variety of other civil litigation matters.